Spring is here! Time to learn tips and ideas to better manage your staff from retention to recruitment and how to optimize productivity. 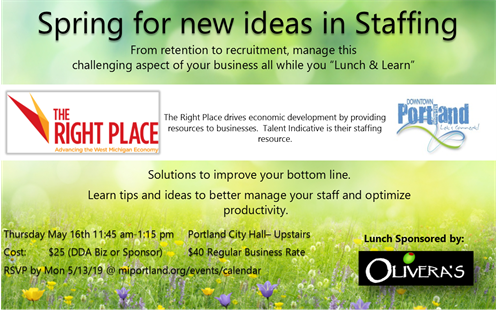 Join our presenter Cindy Brown, Vice President of Talent Initiatives, for the Right Place as she covers this topic and how to manage this challenging aspect of your business all while you "Lunch & Learn." Similar workshops cost up to $150 without lunch. We're delighted to be able to offer this valuable business information at these reduced rates right in your home town! !